Frieda Loves Bread: This Dish Made it's Way to My Husband's Heart! 33 This Dish Made it's Way to My Husband's Heart! My husband is quarter Italian, but he would tell you his stomach is 100% Italian. The way to a man's heart is through his stomach, right? Well, this dish passed GO, collected $200 and landed in prime real estate space in my husband's heart. Manicotti, Italian for "sleeve" is traditionally a savory stuffing of ricotta cheese, meat and rolled in a rectangular pasta sheet and covered in a tomato or bechamel sauce. For years, I have been cramming cheese filling into a raw, uncooked manicotti noodle, adding extra water to my canned tomato sauce and calling it "manicotti." Yep. Pepperoni! If you think about it, my Marvelous Meatball recipe has a mix of sausage and ground beef, so why not this recipe? 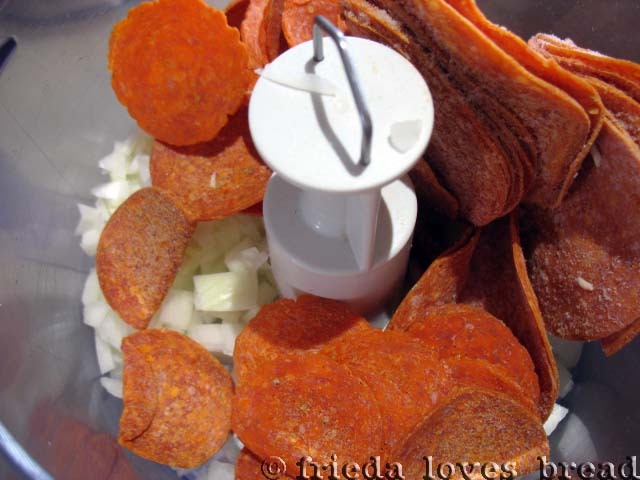 The pepperoni slices are put into a food processor with some onion and coarsely ground. and pulsed till fully combined. 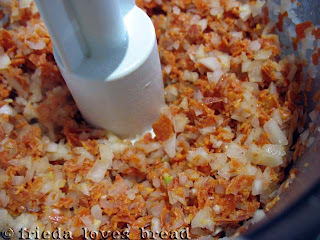 The mixture is transferred into a saucepan and cooked for about five minutes. 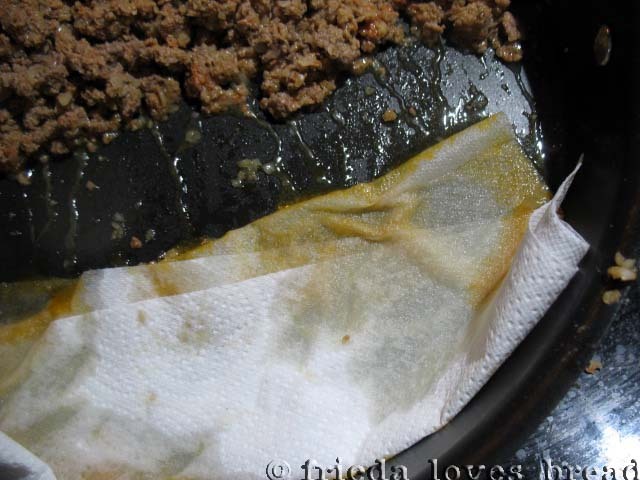 One cup of the cooked mixture is put on a paper towel to drain. This will be used in the filling. Instead of taking the rest of the meat out, I just tilted the pan and put a folded paper towel in to soak up the rest of the fat. 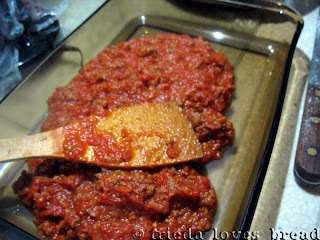 To the drained ground beef, tomato paste is added. Are you tired of using only a wee bit of tomato paste and throwing the rest out? 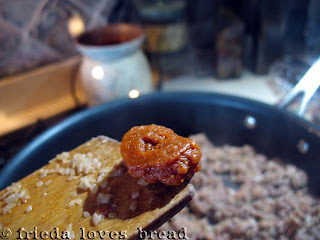 Check out my earlier post on freezing tomato paste. Garlic....I freeze my garlic and put it through a press. Minces it up perfectly. A dash of red pepper flakes, anyone? The great thing about cooking your own dishes....you can adjust the heat! and simmer till thickened. Can you smell it now? Now it's time to make the filling. I cannot for the life of me fine shredded Provolone. 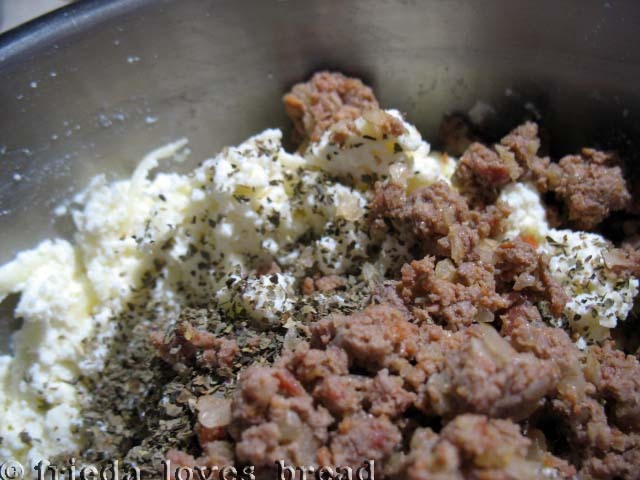 It's always in slices, so this bag of Italian Five Cheeses added to ricotta works for me. One large egg is beaten and added to hold everything together. Don't forget to add the one cup of meat to the cheese! By this time, the sauce is ready. Put half of it into a 9x13 baking dish. and put them seam side down into the pan! After rolling all the manicotti, put the rest of the sauce on top. Cover the pan with foil and bake. 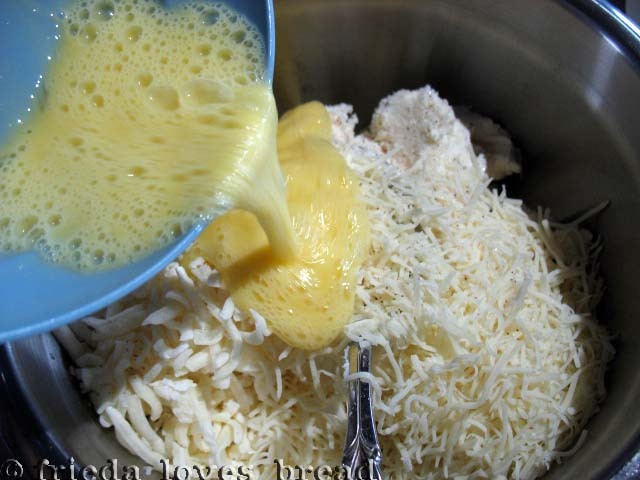 At the end of baking, remove the foil, sprinkle some cheese on top and bake an additional 5 minutes. Let the dish cool for 15 minutes. Cooling is important! It allows the dish to thicken, set and makes the manicotti easier to dish out. The food that will make its way to YOUR heart! Oh my! 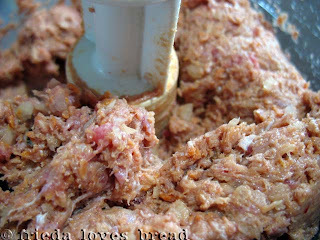 My meat-lover husband would absolutely love this! I am definitely making this. 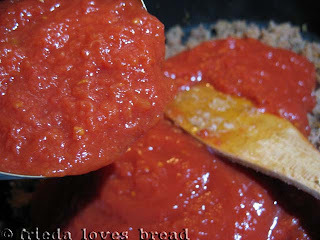 Thank you so very much for the tip on tomato paste!! 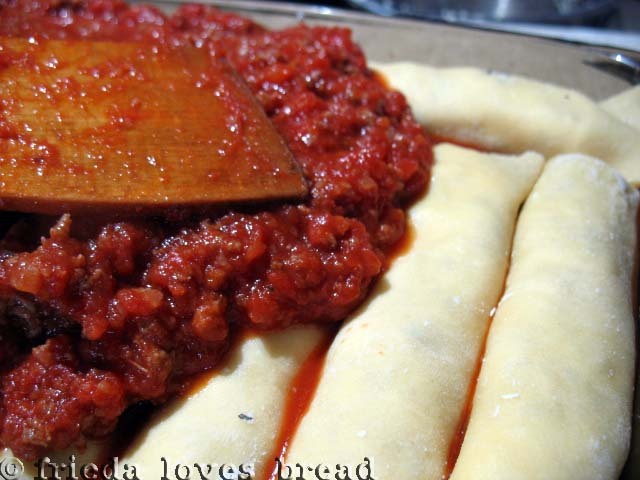 Now that's Italian comfort food at it's tastiest! The guy in my life would probably turn his nose up at this--he is a hard sell when it comes to Italian. However, we all would love it! 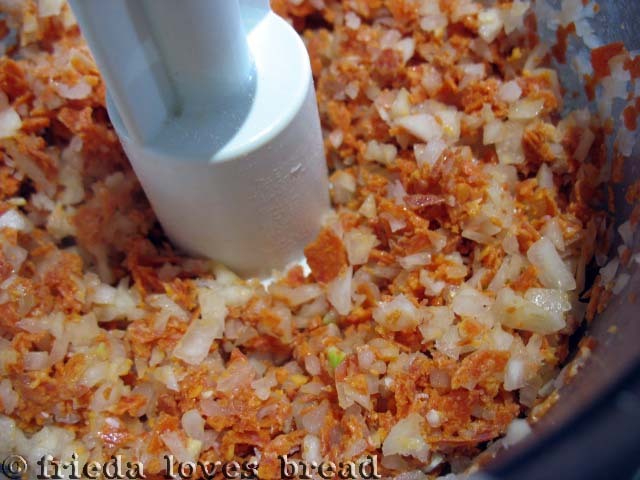 I am now following you, and I am definitely a bread maker! I have made bread long before bread meakers came out, but I have to admit that I like the bread maker! 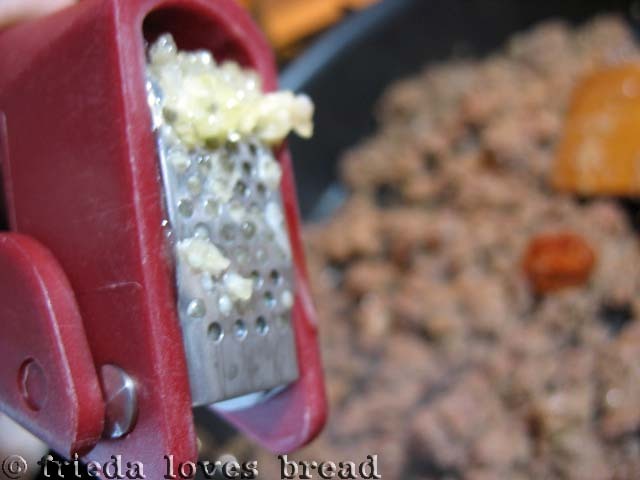 It makes the bread making task easier. Check out my blog if you like, too. Mama mia! Una praza da rey! Hi Freida. Your dish looks so delicious. I stopped by to visit, say hello and thanks for the add on FB. I write a blog on food and relationships. All told through stories about food and relationships! Please visit when you get a chance. Maybe follow, if you like. That would be very cool. Again, thanks. A presto! wow, now I can understand why your husband enjoys this dish, it looks so very very good! Hey there new Foodbuzz friend! I'm your newest follower! Looking forward to reading all your posts. Consider checking out my blog! Happy Tuesday!!! these look delicious!! and your bread gallery... *drool* I love bread! Love it! Wow!! I can see why it won his heart! I have a feeling my husband would be just as happy. This one is now at the top of our "to try" list!! Wow! I am going to have to make this. Looks great! This is so cute. 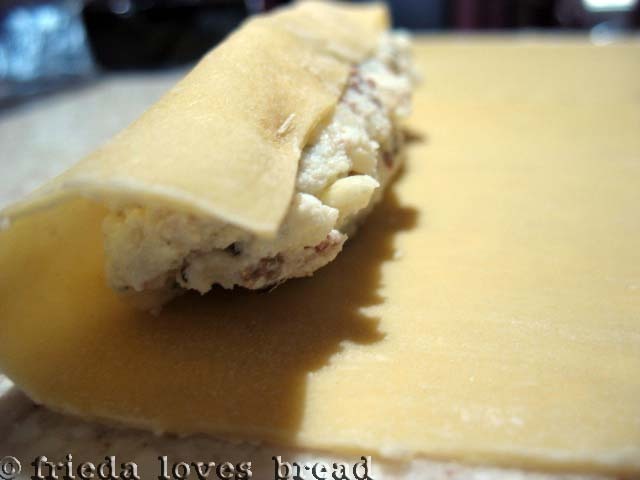 I have the same thing going on, part Italian but wish to bake and make pasta 100%. Wow, lots of flavor going on in this dish! Delish! 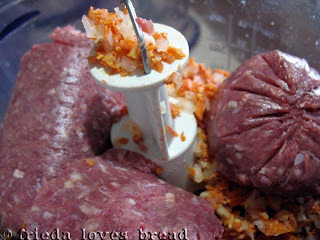 Ground pepperoni? Whoa, is that legal? Looks amazing Frieda! Thanks for friending me on Foodbuzz, I'm so glad I stopped by! 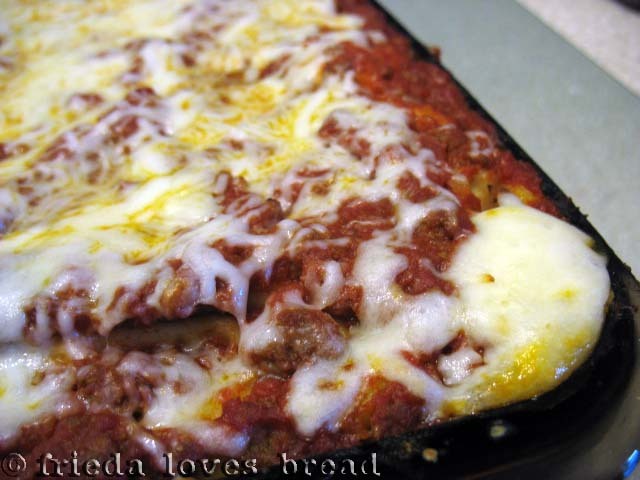 Your manicotti looks delicious and I love the addition of pepperoni! 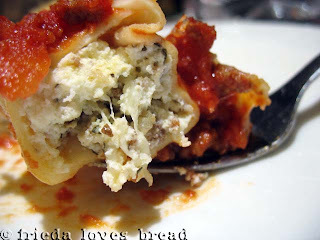 Love manicotti and I love that you added a little kick w/ the crushed red pepper. Yum! Yep. My heart has officially been stolen. I love love love manicotti. Can't wait to try this recipe! I'm really liking your blog! I haven't thought about making manicotti in years and sure didn't think about using my pasta maker to make the noodles...duh! Wow! I want some of this right now...and I'm sure my husband wouldn't be able to resist either :) This looks amazing! Oh man...this looks amazing! Love it!!! How funny, I just made this on Sunday (Cook's Country, right? ), and it is so good. The pepperoni really makes it delicious without being overpowering. 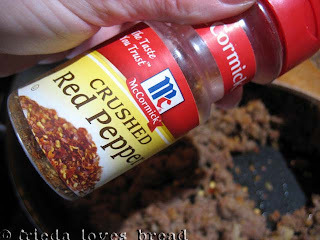 I am making this tonight. The picture looked so good. 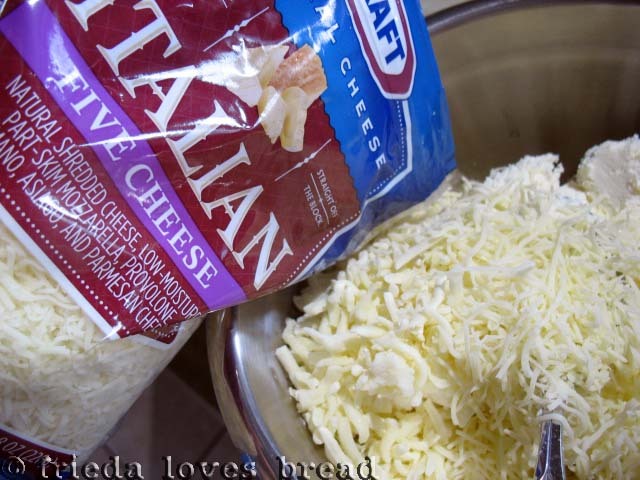 I bought sliced provolone and sliced it really thin to resemble a coarse shred. I will let you know how it turns out. Oh my gosh!! It turned out amazing. My husband went back for seconds. Woo Hoo. Erin, WOOT!! 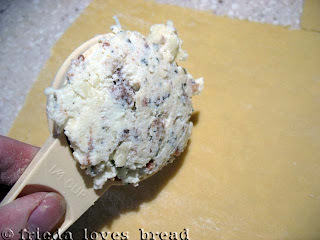 I should have re-named this post "MANicotti"!! We definitely have a winner on our hands, don't we? 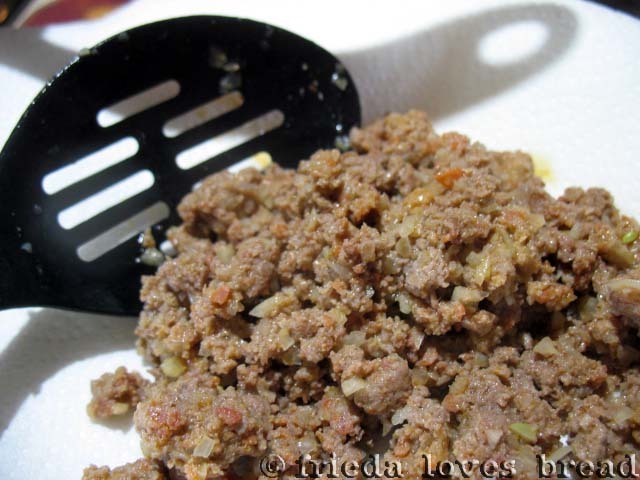 Debbie, yes, this is a Cook's Country recipe...it was so good, I just HAD to share it!